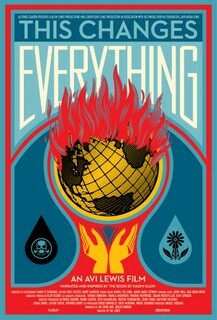 This Changes Everything - The Movie based on the Naomi Klein book. FREE Showing in Baltimore, MD. This movie is an epic attempt to re-imagine the vast challenge of climate change. The film presents seven powerful portraits of communities on the front lines, from Montana’s Powder River Basin to the Alberta Tar Sands, from the coast of South India to Beijing and beyond. Interwoven with these stories of struggle is Klein’s narration, connecting the carbon in the air with the economic system that put it there. Throughout the film, Klein builds to her most controversial and exciting idea: that we can seize the existential crisis of climate change to transform our failed economic system into something radically better. Showing is part of New Economy Week - From Austerity to Prosperity —a public conversation about the ideas that can transform society and build an economy where people and the planet matter. Parking is available for free at the church. NOTE: There is also a free screening Mon Nov 9, 7-9 pm in a church in Laurel (INFO and RSVP here) and in Columbia on Tuesday, Nov 10, 2-4pm (Info Here).